Join the revelry and debauchery at McGuire’s Irish Pub in Destin. Fear not, for floggings only begin when the party stops … and that hasn’t happened since it opened in 1996. McGuire’s might not be found in any of the Irish folklore, but you’ll be a believer in the luck of the Irish when you come across this pub. As soon as you enter, you’ll notice the ceiling, walls and just about everywhere else is completely covered in dollar bills. It is a McGuire’s tradition for visitors to write a note on a dollar bill and staple it to the wall or ceiling, so your visit is forever emblazoned on the restaurant. On the way to your table, you might pass by the brewery that’s located inside the pub. That’s right … McGuire’s has its very own copper and oak brewery on the scene. Whether you enjoy a stout, red ale, light ale, IPA or porter, McGuire’s has a brew to quench your thirst. And since it’s a family-friendly establishment, homemade root beer is also served in frosty mugs. If you prefer grapes to hops, McGuire’s is no slouch when it comes to wine. In fact, the pub has one of the largest wine cellars in a restaurant worldwide. With more than 8,000 bottles in a meticulously monitored cellar, McGuire’s will certainly have something to accommodate your tastes. The menu at McGuire’s will have you telling tales for years to come. Start off your feast with an order of the Irish Boxtys – flash fried mashed potatoes served with a variety of dipping sauces. Traditional pub grub is filled with classics such as Shepherd’s Pie, Corned Beef & Cabbage, and Irish Lamb Stew. These dishes all come highly recommended for a taste of the old country. If traditional isn’t your scene, McGuire’s has a massive angus steak burger menu. Choose from more than 25 different burger combinations, or go rogue and create your own masterpiece. Be sure to check out the steak and chops menu, revered as the best on The Gulf Coast. Add a cup of the famous Senate Bean Soup to any of your meals for only $0.18! If you still have room, cozy up to an order of the Homemade Bread Pudding with Bushmills Irish Whiskey Sauce after your meal. Let the live bagpipers serenade you, and stay a while at McGuire’s Irish Pub in Destin. 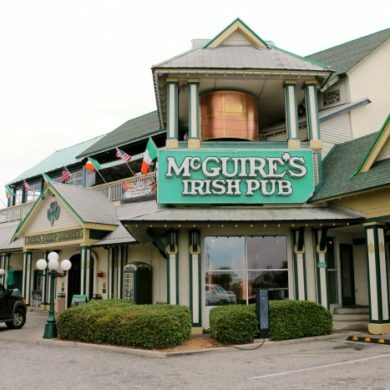 McGuire’s Irish Pub is located at 33 US Highway 98 in Destin FL. For more information or to see a full menu, visit the McGuire’s website or call (850) 650-0000.